This was a great experience, to say the least. The chef was super personable and he made some amazing jokes. Now, if you have never been to a Hibachi grill, they spin knives and spatulas all around, make clanking noises and do fun things like tossing the food into your mouth. It was an enjoyable experience watching him throw the food around, swing the knives and pokers around, and he threw a piece of broccoli into everyone of our mouths. If it hit our mouths just right, and we caught it, he would make a great joke towards how hungry we were. If we missed, he would toss another piece. As he was making the food, he did the fiery onion, he asked how many different things we all wanted, and in my needs, he asked all the right questions. I even asked him about the mustard (a staple in the bodybuilding world) and he promptly told me that it had some dairy added to it. It was nice that he was able to help me out in that respect, and didn’t just do as I had asked, without making sure it fit my needs. When the food was done, albeit it was very “boring” compared to the filet minon and shrimp that the others got, the chicken was grilled to perfection, the veggies were just right and they brought me out the white rice that I needed. I was able to divvy out the specific amount that I needed to fit my macro nutrient requirements for that specific meal. There are very few places that are willing to do this, or take understanding in it. I am so happy knowing that this was a possibility there. The first time I went there, in the sit down portion of the restaurant, I didn’t come out of there feeling very good. Now this was before I found out that I had gastro problems, which when eating fried stuff can be bad. If you are okay with fried foods, the tempura is really good and the atmosphere is amazing. This is definitely one of the places that we love to go visit and enjoy when we aren’t out helping our clients, listing homes or having fun in our Ninja trainings here at the office. 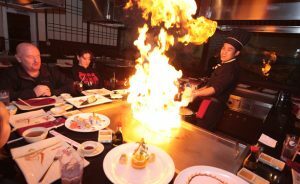 Next time you go to Fuji, make sure that you go to the Hibachi side of it. If you have never been there, make sure that you do the Hibachi grill side of it. And go with a party of people, have fun with the chef, as they are so interactive with you and make it a very enjoyable experience.